Innergex is currently pursuing several development opportunities in Saskatchewan. The Saskatchewan government has set a goal to generate up to 50% of the province’s energy from renewable sources by 2030. The next competitive procurement is expected to commence in mid-2019. Each wind project to be proposed by Innergex would capture the renewable energy of the wind to generate electricity and is anticipated to produce between 100 and 200 MW to help the province achieve its climate change goals. The projects are in early stage of development and are dependent on our successful selection in the SaskPower wind procurement processes. We expect that the configuration, size and footprint of the projects will be refined in consideration of environmental, technical and consultation inputs received during the development phase. Some of the prospective projects in Saskatchewan are the Yotin Wind Project, North 49 Wind Project, Gusty Plain Wind Project and Prairie West Wind Project. Financial agreements with landowners on land where turbines could be located. Construction and operation phases would create significant benefits in terms of employment and the use of local resources. Preference would be given to retaining local persons, consultants, businesses and/or contractors throughout the life cycle of the project, provided that costs and quality of service are reasonably competitive. Municipalities could receive revenues from taxation directly or indirectly. Innergex has a long history of sponsoring and supporting local associations, legacy projects, and community events. Furthermore, Innergex will engage with local authorities to ensure potential wear and tear on local infrastructure as a result of the project is addressed. Wind is a source of clean, reliable, renewable energy. Wind energy is emission-free, creates no waste or water pollution, and helps communities and governments achieve climate change goals. The annual emissions that could be displaced by a 200 MW wind project is about 500,000 tonnes of CO2 from thermal generating stations, equivalent to removing approximately 100,000 cars from Saskatchewan’s roads. Wind causes turbines blades to rotate. A rotating generator located within each wind turbine converts wind energy into electricity which is transmitted to a collector system. Collector systems consist of overhead and buried conductors that transmit electricity from wind turbines to a substation, typically at 34.5 kV. The substation increases voltage for transmission over long distances. Electricity is transported to consumers along an overhead cable called a conductor or transmission line. The team at Innergex keeps up with emerging technologies to ensure we are able to make the best decisions possible on the latest information available on turbine components, keeping efficiency, low noise, performance and cost as the main criteria. When evaluating a wind project configuration, Innergex meets or exceeds best practices for siting and noise levels, which aligns with regulated standards that are expected to be put in place in Saskatchewan. The sound of wind turbines heard from outside residences, in accordance with typically accepted guidelines, must equal or be inferior to 40 decibels (dBA), which is comparable to a soft whisper from 2 m away in a library. Additionally, rigorous scientific research to date indicates that wind turbines sited in accordance with regulated standards and best practices pose no health risks to nearby residents. Wind energy generates electricity without emitting greenhouse gases or air pollutants and uses no water – creating a healthier environment for people and wildlife. Health Canada released a comprehensive study on noise and health-related to wind farms in 2014 which looked at 1,238 households and recorded more than 4,000 hours of noise measurements. No evidence was found to support a link between exposure to wind turbine noise and any of the self-reported illnesses (such as dizziness, tinnitus, and migraines) and chronic conditions (such as heart disease, high blood pressure, and diabetes). No association was found between the multiple measures of stress (such as hair cortisol, blood pressure, heart rate, self-reported stress) and exposure to wind turbine noise. The results of this study do not support an association between wind turbine noise and self-reported or measured sleep quality. While some people reported some health conditions, their existence was not found to change in relation to exposure to wind turbine noise. No association was found with any significant changes in reported quality of life, or with overall quality of life and satisfaction with health. This was assessed using the abbreviated version of the World Health Organization’s Quality of Life Scale. An association was found between increasing levels of wind turbine noise and individuals reporting to be very or extremely annoyed. Our passion to produce renewable energy exclusively stems from our profound belief that we can all make a difference in making the world a better place for future generations. At Innergex, environmental sustainability is a key part of our development strategy. We are driven by the belief that what we do matters as much as how we do it by developing projects that mitigate or compensate for the impacts on the surrounding area. Every prospective wind development project has a list of environmental considerations to follow, including the initial assessment, compliance with stringent provincial and sometimes federal environmental regulations, and long-term monitoring programs. Environmental assessments require comprehensive studies to be carried out by independent qualified professionals. They also involve years of consultations with regulatory agencies, First Nations, stakeholders, and the public. The Environment Team at Innergex, often working alongside independent third-party environmental consultants, ensures that all pre-project studies are completed in regard to potential impacts and mitigation strategies of projects. Conducting pre-project environmental assessments is crucial to the understanding of a site. The information collected is used to refine the siting of infrastructure within a project area and is incorporated into the regulatory report. Innergex takes great care to ensure the proper environmental reviews are completed before any submission to a SaskPower Request for Proposals. Prior to constructing a project, rigorous regulatory processes with multiple requirements and layers need to be expertly addressed. In general, wind projects could be located on federally or provincially regulated lands which would be subject to different regulatory processes as outlined below. STEP 1: Does the Environmental Review Process apply? The provincial environmental approval process for a commercial wind energy facility includes completing a Technical Project Proposal (TPP) which is submitted to the Saskatchewan Ministry of Environment’s Environmental Assessment Branch (EAB). STEP 1: Is the project considered a “development” under Sec. 2(d) of the Environmental Assessment Act? The EAB will review the TPP and determine if the project is approved, requires additional information, or if the project will be subject to a full environmental assessment pursuant to Saskatchewan’s Environmental Assessment Act. Once approved, the Proponent may obtain the necessary provincial permits and start construction. A description of the Project (including components and activities) and its location (i.e., existing environment). Results of engagement activities and field surveys (e.g., wildlife, plants, wetlands, heritage resources, etc.). Potential effects of the Project on the environment and mitigation strategies to avoid or reduce those effects. Description of post-construction wildlife monitoring program to measure actual Project effects. Do wind turbines harm wildlife, including birds? Each project developed by Innergex is subject to environmental assessments to ensure that its potential effect on the immediate surroundings, including plants, birds, bats and other wildlife, are carefully considered before construction is allowed to start. Measures are taken to avoid or mitigate negative effects a project may have on the surrounding ecosystems. Detailed environmental studies and an environmental regulatory review, which includes a public consultation process, would take place should a project be selected by SaskPower. Are wind turbines noisy? Improved design has drastically reduced the noise of the mechanical components so that the most audible sound is a “swoosh” of the blades passing the tower. In past developments, Innergex has always maintained a distance from any residential dwellings that is considerate of sound levels, recognizing that wind turbines do make noise. 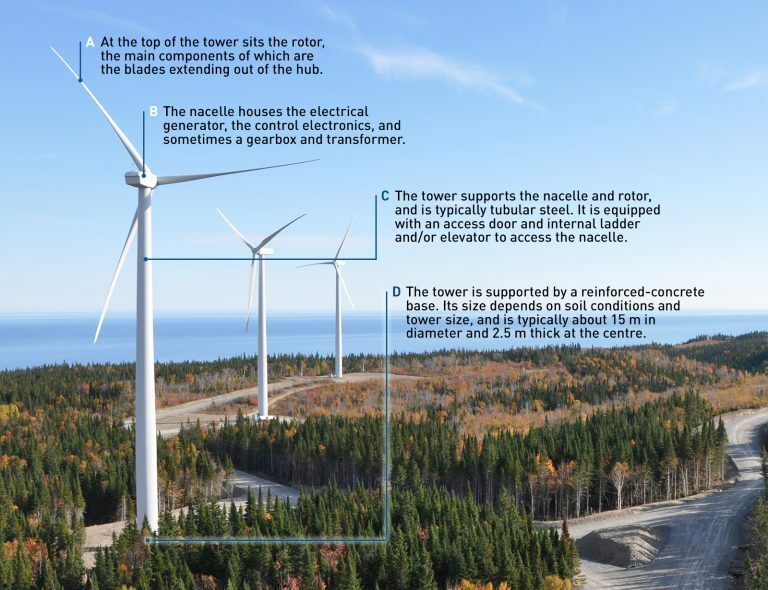 While people have been living in proximity to modern wind installations for over 25 years in Canada, the sound and the proximity to homes and businesses are critical elements to properly siting and developing a wind project. The intention is to arrive at the best possible final layout that balances technical, environmental and social considerations. The sound of wind turbines heard from outside residences, in accordance with typically accepted guidelines, must equal or be inferior to 40 decibels (dBA), which is comparable to a soft whisper from 2 m away in a library. Do wind turbines harm human health? The balance of scientific evidence and human experience to date clearly concludes that wind turbines are not harmful to human health. However, this is a subject that has received a lot of attention and debate, especially in Canada following increased renewable energy development in Ontario beginning in the early 2000s. According to Health Canada, the most rigorous studies available to date do not show a link between exposure to wind turbine noise and harm to human health. Wind energy is, in fact, one of the cleanest, most environmentally friendly energy sources. It emits no toxic substances such as mercury and air pollutants – which can trigger cancer, heart disease, asthma and other respiratory diseases. Would there be any major impacts during the construction phase of a wind project? No projects are without some impacts. However, Innergex takes its environmental responsibility seriously and works hard to ensure that any potential impacts from a project are carefully considered and avoided wherever possible. The local community would be engaged to identify ways to minimize disruption during construction and these approaches would be taken into consideration.